I was worried that U-Z would be difficult, but I actually really enjoyed doing those letters! I think the fact that there are fewer popular animal names that begin with those letters made things a bit freer. So here they all are! You can see them in detail at my website. Update: due to a certain amount of interest, I’ve started to make prints available. If there’s any work you’re interested in that you don’t see available, please let me know! Wow, you are so talented:) Congratulations on being Freshly Pressed… that’s how I found your website! Wow, love them! It’s hard to decide which are my favorite, but I really love how you did the “H,” “K,” and “Q.” Off to check out your website! I’m LOVING your illustrations — I think the “R” for raccoon is my personal fave, though they’re all amazing. This is so cute! It would be great in a nursery. I love this! For future reference, would there be a way to get a print for a child’s room? I’m currently working on putting together prints. Please check my etsy page, I’ll be updating it very soon! Your design style is wonderful! I visited the individual letters on your superb website and as each one opened up so did my mouth. I ended up gawping at each and every one. Lovely stuff. But just what is a Xiphias, please? Xiphias gladius is the scientific name for the swordfish. Wow, this is way more thoughtful than my friend’s and my “Let’s say a cuss-word for each letter” game. You should sell prints of this! Thank you for sharing, & congratulations on being Freshly Pressed! Thanks! Personally, I have a soft spot for all the birds. All of the letters were painting in gouache. I couldn’t stop admiring each little work of art. It’s as if each animal patiently posed for you in your impossible shapes, while you took the time to captured their character. I love the expression of the Giraffe, the Lemur watching whether it’s tail stays up and the cheeky Hog. Thanks for sharing them; it made for a a pleasurable half hour at the end of a very tiring day. Thank you for taking the time to leave a very kind comment. I’m glad you enjoyed them so much! Wow, this is amazing! I can’t pick a favorite but the otters and the giraffe are so sweet. Love this. That’s fantastic! It’s super cute, creative and artistic – well deserving of freshly pressed 🙂 Thanks for sharing! The yak is my favorite, followed closely by the raccon, but they are all delightful. Excellent control of a tricky medium! AAAAAAMAZING!!!! So whimisical – would love it on a nursery wall!!! How genius! It took me a while…lol… i mean, they are so clever and beautiful…”F” is my favourite…. very dramatic and glamorous…. I LOVE this! Thank goodness for your tags because I did not know what some of those animals were. But it’s so great that you chose unique and maybe unknown animals. The narwahl is pretty fabulous, but I, of course (given the name of my blog), love the corgi too. I’ve been through my share of alphabet books (kids, kids, kids) and these letters are beautifully detailed. Congratulations! That’s a wonderful piece of work. I love how you have incorporated the animals’ bodies into the shape of the letters. Can’t really pick out which letter I love the best! 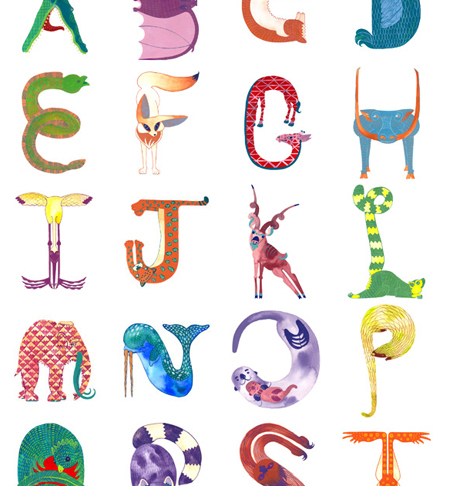 A fantastic display of the alphabet. You did a amazing job! I love the Anibet! If you’re still interested, I’m working on selling them! Please check my etsy page, I’ll be updating it very soon! Fantastic work. I had to go to your site to appreciate the detail you put into each one. I feel stupid having to ask this question, but the letter X. . . I know swordfish is wrong. Please solve this little mystery for me. No, your right! I cheated a little- Xiphias gladius is the scientific name of the swordfish. These are really beautiful! Are you selling them? I’m working on selling them! Please check my etsy page, I’ll be updating it very soon! Those are quite beautiful! You’re very talented. Oh, these are wonderful! It reminds me of an old one called Tarantella, which was all bugs and worms, if I remember rightly. Yours are more detailed, I think, and in color, wow! Thanks! The Tarantella sounds wonderful, thanks for mentioning it. I’ll look it up ASAP. Truly amazing work! beautiful and fun! Thanks for sharing! Beautiful work! Such detail and time has been spent on this and it looks fab. It would be almost impossible to say which one I like the best because they are all so wonderful, but I am partial to the Otter, Elephant and Lemur. Congrats on being FP’d it’s well deserved! that’s pretty magnificant. how long did it take you to do this? Thanks! I believe I started these guys at the end of August, then worked on them on and off until I finished about two weeks ago. Such an amazing talent you have! Beautiful work. Congrats on being FP! Clever concept and beautifully illustrated. I loved the giraffe. What an awesome illustration. First place I would take it, is to Autism Centres and Speech Therapists. Big $$$$$ looking for something like that to help children associate. Thanks, and thank you for the suggestion! This is soooo cute! I want to wallpaper my room with these! Is N a narwhale?! So Awesome! ‘X’ marks the marlin is X-cellent. My favorite is the H. It made me crack up. Well done. Best of luck with your illustration career! love them! these should be compiled into a childrens book with some additional illustrations. or maybe that’s your plan and you’re way ahead of me. my son would love to learn with beautiful colors and drawings like these! thanks for sharing! I want Xiphius Gladius to be my pen name. I also want to buy a poster. Goahgeous, Caitlin Clarkson! that’s really cute!! awesome work! I’ve always wanted to study typography! It’s pretty fascinating, isn’t it? I must admit…. you are so crazy.. These are beautiful! Definitely following and checking out your website! Are they watercolor?? Aw, thank you! While I have a soft spot for watercolor, these were all done in gouache. Wow, you have quite the artistic ability! Great job! I had no idea this type of art form was called an Anibet, it’s my interesting fact of the day! I really admired your positive energy. Although you admitted that you struggled with the last bit of letters, you turned those feelings into an opportunistic moment for yourself, a chance to be a bit “freer” as you mentioned. The most important thing when it comes to pursing a career path or a hobby is that in the end you are enthusiastic and enjoy partaking in that specific activity! Thank you for sharing your work and keep it going! If it is okay with you, I would like to mention my own blog that I just started and share the link with your readers. It’s called Logic Meets Reason and it would be great if you and your readers could comment, subscribe, and take a look at the pieces I have posted! Here is the link: http://www.logicmeetsreason.wordpress.com. Thank you for leaving such a thoughtful comment! I agree, enthusiasm for your work or even a hobby is such an essential part of life. I really enjoyed reading the articles on your blog, especially The Scales of Life- you’re a very talented writer! I’d be honored if you mentioned my work; be sure to let me know if you do, I’d love to see! Wow! great. You’re so creative. Oh my goodness, that is just adorable!! I wish I could get that creative! Is there a larger image of the same? weould love to admire ’em in all their detail. I think that is probably the sweetest ‘O’ I’ve ever seen! These are fantastic! Awesome. These are truely stunning. I wonderhow long it took you. With labours of love time doesn’t really matter. Very cute, I love the O and the B! I love letters. I have a whole collection at home in different shapes, sizes, materials and patterns. No animals yet though. Your drawings are really clever. I love the letter O with the mummy and baby otters and the A where you have used the tongue to make the bar in the middle…they are all very good. What size are they in real life? Thanks! A and O are two of my favorites as well. The letters all vary in size to a certain degree, but they were all done individually on sheets of 9×12″ paper. Wonderful! “W” is my favorite, as a walrus is my favorite animal! wonderful, I think, indonesian children will be confused with : kudu, narwhal, otter, pangolin, quetzal, sloth, toad, vicuna and xiphias. they are not familiar with the names and the animals itself. but, it will enrich their vocabulary. Wow, these illustrations are beautiful.. I can look at this all day! What materials did you use to make them? Thanks! These were all done in gouache. Fantastic. I’d love to feature your illustrations on my blog http://www.artstormer.com. contact me! Your craft makes me think of the way children appreciate the wonder of learning things that grownups have long forgot to enjoy. Thank you for your work! Really beautiful work. I’m going to share this with my first graders on Monday. I love the use of color and shape! Good work! These are absolutely lovely! You are inspiring illustration-envy! Hey i love mostly because my name is anibet that’s how i found this amazing work of art. Nice name choice by the way. How did you come up with such an amazing name. That is so cool. i love animals.